This is where I plan to diarise the most interesting bits of the month to month happenings at the RVLR. The March and April working weekends were spent connecting up the track, levelling it and then ballasting. We finished the ballasting around 4pm on Sunday 7 April and then called it a day and went in for tea and cake. The weather has been much kinder this year and we have not missed a single working weekend. We’ll still need an extra day before we open to tidy up the track and cut back any errant foliage along the way but otherwise we’re ready to welcome the public again. Work on Powys has continued apace; the lubricators are on as is all the boiler cladding. We will shortly be doing some trial runs and a boiler inspection will be required before returning to active service. 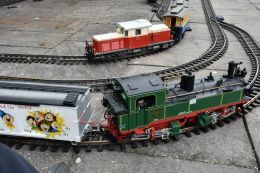 Jack was given a once-over before the new season and will be ready for 4 May, our first open weekend of 2019. Do come and join us! 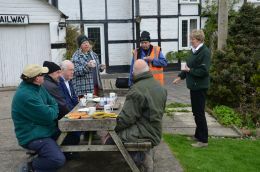 Due to the continued mild February weather, Mike decided that it was worth putting in an extra working day and 6 volunteers joined him. The new gauge frame was fitted to Powys along with the regulator valve and the steam test was successfully performed at 100psi, much to everyone’s relief. It was lovely to hear Powys under steam once more and Keith and Mike took a closer look (see photo). 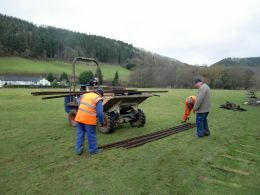 In the meantime, the other volunteers completed the new track panels and then started to connect them to the existing track. We managed to do over half the track thus leaving a few more connections plus some straightening for next weekend. 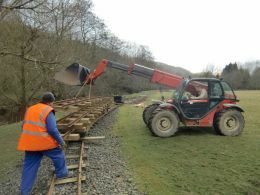 After a little snow in the week, the dry weather during the first weekend of February enabled 6 volunteers and Evan and his JCB to get all the ballast down and rolled flat on the Saturday, leaving the Sunday team to put the new track panels on top. Mike’s numbering system and Evan’s JCB really helped to get this done by lunchtime but then we discovered that we were about 6 panels short (as Mike had included some curved ones in the original calculation – we need straight ones!). We built up 2 panels in the afternoon sunshine accompanied by buzzards and a red kite. 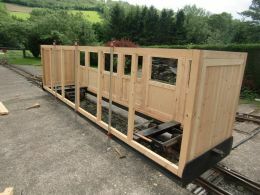 Next month will see us make another 4 panels, lay them on the track bed and connect them up (weather permitting). 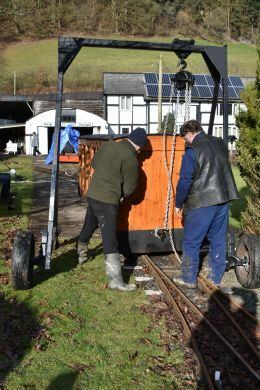 I don’t want to speak too soon, but we are currently ahead of schedule on this winter’s track work……..
Powys: The boiler water level gauge had been repaired but it was pressure tested at the weekend and found to be leaking. It was decided that further repair could not be done safely and a new pair of valves would be ordered. All the necessary measurements were taken and Mike would find a suitable supplier. On the 5th February, Mike announced that he had found a suitable supplier at a reasonable cost and would be purchasing a new pair. The lubricator has been overhauled by Mark and was re-fitted to Powys. The lubricator is operated by an arm from the clevis on the valve rod but the shouldered bolt to connect it has disappeared. John said he would make another in time for the next working weekend. An intermediate working day will probably need to be organised before March to progress Powys as there is a lot more to do before it is ready for the 2019 season. Jack: It was noticed that Jack’s handbrake cable needs to be raised to prevent it snagging on points etc. Monty: Monty needs a new fuel tank and Mike is currently in search of a plastic replacement. The mild weather encouraged the huge total of 12 volunteers to come out for the first Working Weekend of 2019 to work off all that Chrismas pud. Consequently we managed to complete about 20 track panels (see photo) and are well on the way to the 30 new ones that are required. 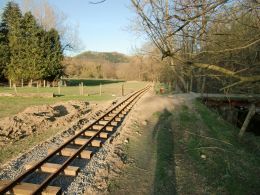 If the weather continues to be kind in early February for the next Working Weekend, we will be ballasting the new track bed. Evan will bring a side-tipping digger and a Hy-mac which will mean that the only human intervention will be raking and levelling the ballast. This will make life a lot easier! Powys: the plumbing work continues; all the cold water feeds to the injectors are finished and the steam pipework is being refitted on the boiler. A steam test is planned for next month, fingers crossed. Saturday 1st December dawned wet but mild and Evan Watkins and his son Evan were employed to dig out 165m of trench where we had lifted the old rails. Mike had set up the laser in the middle of the track bed which made it easy to ensure a gradual 1:200 level throughout. 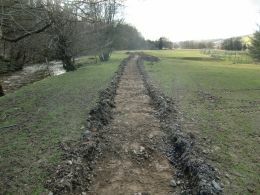 Sunday was largely dry and, despite the mud, good progress was made and the whole track bed was dug out by 4.30 pm. This means that next month, weather permitting, we can start to ballast. During November, the car park area near the station entrance was re-surfaced which has improved the drainage and will make it better (and drier) for visitors next season. Powys: Keith and John spent the weekend making and fitting the injector pipes. Mark has completed the refurbishment of the mechanical lubricator and this will be re-fitted in January. Monty and Jack: Both engines are enjoying a rest this month. Recover the bogies from the old carriages which Jack Woodroffe made and start a new steel-frame toast-rack style carriage.This will allow a seat to be removed to accommodate a wheelchair. As you can see, we have a lot of work to complete so do come and join our friendly volunteer team – there are always bacon butties, hot tea and home-made cake! The first working weekend of this winter was dry and mild which enabled us to progress well. On Saturday, the remainder of the oldest rail (200m of it) was lifted to be renewed. With machinery on site and Bernard having removed the fish plates beforehand, this job only took an afternoon and we were able to survey to track bed on Sunday. This revealed a smooth gradient so no problems are envisaged (!). 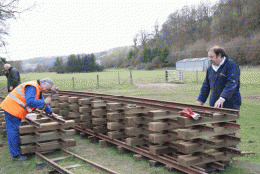 240 sleepers were delivered earlier in the week and the Sunday group made up the first track panel. Only 25 to go. 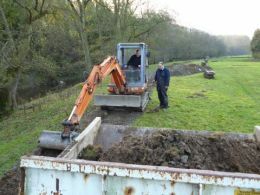 Colin from the Barn Well Hill railway came to pick up the spare rail on Saturday. 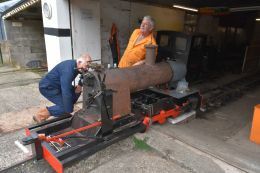 Powys: Keith and John spent the weekend bending and fitting the steam and water pipes and injectors. The sealing plates around the blast pipe in the smoke box have been refractory cemented in. The weather for the last open weekend in 2018 was better than forecast and it was dry, bright and breezy. A warming cup of tea in the conservatory was particularly welcome on Saturday due to the north-easterly. Monty: Monty is awaiting a bonnet and the leak in the petrol tank needs fixing. 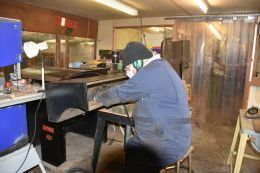 Powys: The volunteers are currently manufacturing the plates to seal the smoke box around the blast pipe and snifting valve. Next month the rest of the copper pipes will be fitted. A whole new gauge glass frame will need to be ordered as the original is now showing its age at 40! Jack: Jack has performed wonderfully all season and will now have a well-deserved rest during the winter. We were blessed with more hot and dry weather at the beginning of September. Many people had been to the Welshpool and Llanfair railway Steam Gala before coming to RVLR and there were just under 200 visitors over the weekend, which made for 2 busy running days. Carl and Pat brought their garden railway equipment from Grimsby and set this up in the garden, much to the delight of children young and old. Powys: The boiler was pressure-tested and the repairs to the motion and reverser shaft were finished. Jack: Injectors were cleaned again. 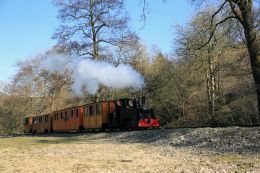 With 85 visitors on Saturday and 96 on Sunday, the railway was buzzing in the hot sunshine. 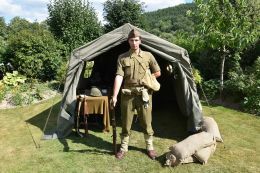 People were thankful for the shade of the gazebo and marquee to have their tea and cake, and Piers’ display of an American Army Signals Unit just after D-Day (including authentic WW2 music) added extra interest. 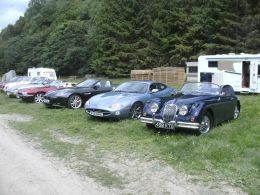 The Jaguar Enthusiast Club (Central region) brought an XJ6, an X300, an XK8 and an XK140 along on Saturday and on Sunday, the car park was graced by a 1938 Austin Ruby 7. Monty: The handbrake has been stripped, reset and welded back into position. Powys: All the copper pipes are being replaced. The smokebox has been drilled and fitted and the motion has been reassembled. The boiler is back in position and has been hydraulically tested. 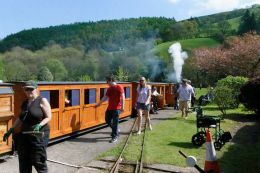 Later on Sunday, the crowds were treated to the sight of Powys hitched up to the back of Jack’s train (complete with Ken and Bernard astride) to test the running. All went well except for the gradient pin working loose, so the thread retainer was tightened. The engineers were pleased with the progress. Jack: Injectors have been cleaned and replaced and, according to Ian, were “working better than ever”. We had 78 visitors over the weekend and yet again the sun shone. The sand martins were very busy hunting for insects affording good views from the train. Work continues apace on Powys with the steam pipes back on for connection to the smoke box. The valves in the steam fountain have been refurbished and the smoke box was re-attached to the boiler. The A frame has been extremely useful for this task and many visitors were interested to watch the ongoing work. Powys’ chassis is back on its wheels and rolling again. Monty is running but awaiting a bonnet engine cover and a new fuel tank. The problem with the blower on Jack last month was traced to a leak in the blast pipe and a new pipe has been fitted. The drivers reported that this has really improved running. The injectors have also been cleaned. Again !!! 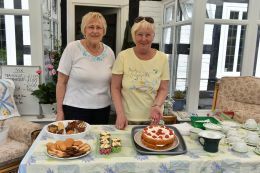 Almost 80 visitors were greeted by glorious sunshine and 25 degree temperatures for the first open weekend of 2018. The site is looking lovely with all the new tree growth, especially near the river where the blackthorn is a lovely foamy white. While the visitors enjoyed tea and cakes on the lawn, some of the volunteers were busy with Powys which has been re-wheeled and the motion refitted. New eccentric arms are being made as one was found to be cracked. The reversing gear and die blocks have been realigned. Powys’ boiler was leaking but this has been repaired and has been certified by a boiler inspector. We were running Jack all weekend, but the blower wasn’t working properly and was deadening the fire. The drivers decided to run with the blower off which provided better draught to the engine. This will need to be looked at before the next open weekend but did not diminish the enjoyment of the adults and children in the Montgomeryshire sunshine. The planned working weekend for the 3rd and 4th of March was scuppered by heavy snow and replaced by the weekend of 24/25 March. We then met again on 7/8 April as planned with Sunday 8th being particularly springlike. Mark has been reassembling the motion on Powys and John is taking the reversing gear shaft back to his workshop for some machining work to lengthen it. 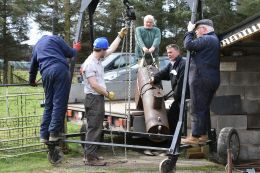 There was great excitement on Sunday as Powys’ boiler returned from Highbridge where it was being welded by a coded welder. The A frame was put to good use as you can see from the photo. Ian continues with the top coat painting and has been doing this work outside in a dust-free atmosphere. Unfortunately, as soon as he had finished, a fly landed on the new paintwork. The panelling for Monty has been ordered. A successful steam test was carried out on Jack, the injectors have been cleaned and replaced and Jack is now ready for the 2018 season. 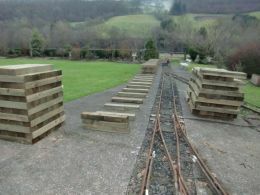 Some rotten sleepers were replaced on the permanent way near the station and all the track has been checked. The lambs are a delight and the trees along the river are in bud. Do come and join us for the first open weekend of 2018 on 5/6 May. Glorious spring sunshine on Sunday 4th greeted 10 volunteers. Jack’s injectors have been serviced and are back at the railway ready to be refitted. Powys’ ‘mislaid’ injectors have been found in the safe place they had been put. The large job of repainting continues; the cab has had a second coat of primer and the tanks have had two undercoats. The March working weekend will be spent putting on some glossy top coat. 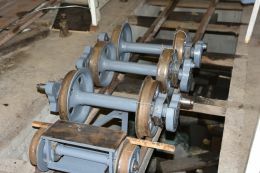 The cylinders have been refitted and the valve gear repainted. Alec is working on the new steam brake. Meanwhile back in Birmingham work continues on Powys' boiler. There ahould be more news on progress next month. 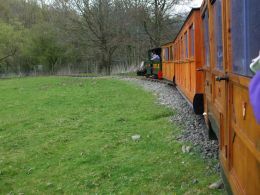 To save the volunteers’ legs, Monty was pressed into service to take people and tools onto the track to cut back some trees which were overhanging the permanent way. Some energetic driving by John meant that the new A frame was deployed to put the last carriage back onto the rails (see photo). All is now well and the track is ready for the 2018 season. A small band of 5 volunteers tackled the jobs this weekend. Jack’s injectors have been removed and taken off-site for their annual service. Our main focus is getting Powys ready for the 2018 running season and work continued on the repaint. The valve gear has been removed off-site for repainting and some minor engineering works. The cab has been stripped, filled and sanded and the first coat of primer has been applied. The same treatment has been given to the side tanks. The axles have had their second coat of primer. The boiler cladding and dome have had their first coat of black undercoat and this has transformed them. Three volunteers managed to brush past the dome while it was still wet and so this will need rubbing down again in places (Ian has threatened to ban all from the workshop when he top coats the dome). And we re-designed the station layout (again). We made good progress over the weekends with the repainting of Powys. The frames have had two coats of undercoat and the buffer beams are ready for red undercoat. The wheels have had two coats of chassis black. The running plates and tank top panels have been stripped, prepped and painted with grey primer. The connecting rods have been grey primed. The side tanks and cab have been sanded and filled ready for painting. The boiler cladding, stumpy dome and cylinder covers, have all now had a coat of primer. For those who are interested in these things we are using Craftmaster paints. 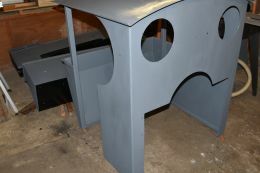 While we had the paint brushes out Piers was tasked with painting JACKS’ firebox back plate with heat resistant paint. We are looking forward to much of the same in January 2018. While on the subject of 2018 may I take this opportunity to wish you all a very happy and steamy 2018. This was a busy weekend of maintenance with much work done on both Powys and Monty. We were glad to be in the sheds as the weather is turning colder. Powys is being completely re-painted while the boiler is off site having a new smokebox fitted. The chassis is currently being stripped ready to received two coats of high build primer. Powys’ side tanks were suffering some corrosion and this was removed using a pneumatic powered needle gun. A couple of patches of corrosion have been found to go all the way through and have been patched and welded. Powys’ wheels are also being painted. Monty is now running sweetly and a new radiator fan was fitted with a thermostatic switch so that the fan is not running permanently. The new horn is very effective. The carriages got their first overhaul of the winter and the roofs received a coat of paint. Richard delivered an A frame which will be used to move the heavier pieces of railway equipment that ageing bodies can no longer move easily. We have recently revamped the master plan for the next 10 years and changed our vision from impossibility to near-impossibility. We will be concentrating on working on all 3 engines this winter with a view to getting all the rolling stock fit for next season. Powys may be a bit of challenge but the other 2 will be ready. We had a good visitor season in 2017 although visitor numbers were slightly down on last year. A number of clubs visited including the Jaguar Enthusiasts' Club (Central Region) who brought 9 cars from a 1960 Jaguar XK150 to 2 e-types, 2 XJS, 2 Mk2 and others from 1971 to 2017. We also welcomed Abermule primary school. 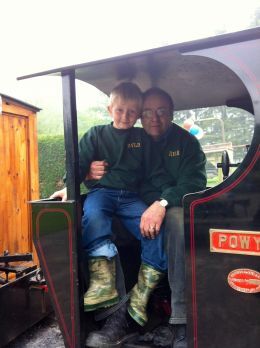 It was great to see all the children and their parents enjoying riding on the steam trains and talking to the drivers. 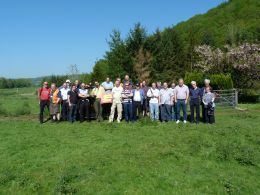 The Narrow Gauge Railway Society visited on Friday 2nd June and according to their News Letter report had a really enjoyable visit to the railway. Just a reminder that the railway is open for private steaming days on the Fridays before an open weekend in the summer with prior arrangement so bring your club along for a day out. 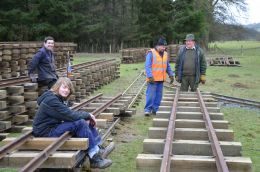 During May and June we continued working on the new coach, ballasting the new section of track and completing several small jobs on the locos and some essential maintenance on the old track. We have stripped down Jack's wayward injector and having given it a good clean it now works fine. As you can see form this months photo we have also carried out some much needed tea drinking practice. Away from the railway progress is being made on the detailed drawings for the first of the new turnouts that we need to construct for the lower extension. This also involves designing some new point levers. I will post drawings on the web site when they are finalised. We had a really great weekend. Excellent weather and a really good attendance. Jack and Powys had to have a test steam on the Friday before the Open Weekend so that the boiler inspector could issue boiler certificates for both locos. They both passed with flying colours. The new track section was completed on time in spite of last months terrible weather and everyone agreed that the run along side the river is now really good. One of Jack's injectors started to play up on the Sunday so we will need to carry out some maintenance on it before the July Open Weekend. Well not so much a working weekend as an Arctic Training Survival Course. With the April Open Weekend looming we had no choice but to soldier on in terrible conditions to try and get all the new track panels fish-plated up. The snow had to be swept off the rail joints before we could get to work. Quite an experience !! January and February working weekends where spent working on the new coach and the new track panels. As you can see from the photo a lot of new track panels have been made and we are very grateful to the lads from the Rhyl Miniature Railway for visiting and helping with the track panels. Away from the railway progress is being made on the detailed re-design of the station area. I will post layout drawings on the web site when they are complete. Well apart from two working weekends which were spent working on the track bed, making up track panels and continuing the build of the new coach there has been quite a bit of action away from the actual railway. Monty's engine has been moved to John's workshop for an overhaul. The engine has been stripped down and several new parts are on order ready for the re-build. Work has started on the design of the points which will be needed for the lower extension and station redesign. This is proving to be quite a task and I am grateful to Brian who is making "the hard yards" by working on the engineering drawings that will be needed. The Friends of the RVLR have launched a "Sponsor a Sleeper" campaign which is very exciting. Full details can be found in a dedicated section of this web site. Please take the time to have a look and if you can help by sponsoring one or more sleepers we would all be most grateful. I hope Santa brought you all something "steamy" in your stockings this year and may I wish you all a Happy and Prosperous New Year. We started early on the Saturday morning moving around 40 tons of 40mm clean stone to act as the base in the trackbed that we dug out earlier in the month. This was accomplished by mid-afternoon and it was then levelled and compacted ready to receive the new track panels. Compaction was achieved by running the Manitou up and down several times and then by using the wacker plate for final compaction. This system worked really well and we have just over 100 metres ready for new track. We spent the Sunday making up track panels and already have about 1/3rd of the new track panels we need ready. Again great progress and a sterling effort from all involved. It was 8 o'clock on the Saturday morning when Gareth arrived to start digging out the old track bed with his mini-digger. We had marked out the section to be dug out on Friday afternoon, every 5 metres, with some red marker paint. Special offer from Screwfix!!. As Gareth moved the mini digger back along the track bed digging out as he went we inserted wooden surveying pegs at the level of the sleepers of the new track panels and Gareth filled the dumper truck with the spoil. This system worked really well and by close of play on the Sunday we had managed to dig out the entire 320 meters that we are replacing this winter and peg out the gradient (1 in 200) ready for ballasting. A fantastic effort from everyone who attended. What a fantastic weekend we have just had. The sun shone, record numbers of people attended, we took more money than we have ever done before on an Open Weekend and we had a visit from a 1950's Midland Red Bus. Fabulous. There was of course the odd problem but things wouldn't have seemed right if something hadn't gone wrong. After running well all day Saturday we lost a pin from Powys's valve gear during Sunday afternoon and had to press Monty in to service to help out with the service. Unfortunatley we couldn't find the missing pin so Powys's valve gear has been placed on the winter jobs list. A piece of "Farmers Friend" was employed to hold part of the valve gear off the ground so that Powys could be returned to the shed. After a couple of runs Monty too decided not to play and as a result running, for the last few trains, was restricted to Jack only. Can I please say a very big thank you to all the volunteers who turned out to help run the railway over the weekend. It was a big effort and everyone had a great time. 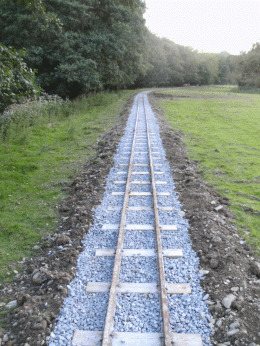 Excellent progress was made on the ballasting of the new section of track. On Saturday with the aid of Karl's Manitou, Ian, Steve, Dawn and myself started to work our way through 75 tons of ballast while Les, Ray and David formed a spot sleepering party to replace several rotting sleepers close to the station. On Sunday Ian, Les, Ray and myself carried on with the ballasting work. As you can see from the photo the finished replacement trackwork is looking really good and you certainly notice a difference when riding over it. 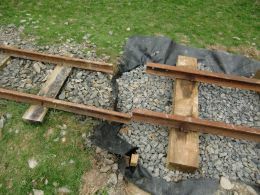 We have managed to persuade Les that there is still a speed restriction applied to the new track despite his best efforts to have it removed !!! Tricia kept up her usual excellent standards of catering throughout the weekend and kept us all supplied with plenty of tea and cakes. Thanks to all who turned out to help it really is much appreciated. It will soon be our September Open Weekend, the main one of our year and I hope to see as many of you as possible over the two days.The next batch of 300 sleepers has been delivered and spikes and fishbolts have been ordered for the next 200m of replacement track. In spite of the monsoon type weather we have been having recently myself, Ian and Ray braved the Welsh rain and convened on the station platform at around 9:30. On the agenda a new level crossing by the river bridge and a re-hang for the station gate. We spent the morning sorting out the gate and making the check rails and timber components for the level crossing. The Manitou and a cement mixer together with a bag of ready mixed sand and gravel arrived at lunch time. Saturday afternoon was spent mixing and laying concrete. We managed to get one side of the crossing done. On Sunday we finished off the concreting and nearly fixed all the timber components. We should finish it off quite quickly next time we meet. Ian, John and myself spent a really useful day fitting a new radiator to Monty and working on the new carriage. As you can see from the photo we are nearly ready to put the roof on. The roof will be covered in canvas which is "glued" to the timber with a matt black paint. In the passed we have used a Farrow and Ball traditional oil based paint but new EU regulations have persuaded Farrow and Ball to discontinue the use of oil in their paints and we are now looking for an alternative supply. If anyone knows of a manufacturer of a traditional oil based paint that is available in Matt Black then please drop me a quick email (mike@rvlr.co.uk) I would be most grateful. We have removed Powys's smoke box door so that we can make a new one. The original has become very thin over the years and is no longer airtight. The original is now on Alec James workbench ready to have a new one drawn up and made. "Water water everywhere and not a drop to drink". Wow that must have been the soggiest weekend ever at the RVLR. Saturday wasn't too bad but Sunday was terrible. The rain was so bad by mid-afternoon that we had to abandon running for safety reasons. It was impossible for the drivers to see the route ahead of them and was therefore too dangerous for us to continue. On a brighter note we did manage to run the rest of the weekend without any "incidents" apart from one of the carriages developing a leaky roof. Thanks to everyone who did turn up to support us especially our volunteers. It was a shame that we had to cancel the ride for the local village Jubilee Party but hopefully we will be able to re-arrange this at a future date. For those of you who didn't brave the elements hopefully we can look forward to seeing you in September when we hold our next open day. 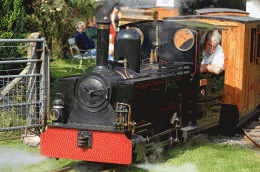 Amongst its activities the society organises visits to railways and trips behind non steam locomotives that are rarely available for passenger carrying. In our case the interest was in Monty as in recent years Monty has not been used to pull passanger carrying trains and has only been used for the permanent way and maintenance train. We were a little doubtful as to wether or not Monty was still man enough for the task but after a really thorough overhaul by John, our new self styled Monty "aficionado" we felt that we could accommodate the requested visit. Jack was on standby just in case but all went well and Monty performed excellently. Well we had a better turnout than I was originally expecting. Karl, Pat, John, Ian and myself on Saturday and Ian, John and myself on Sunday. Most of the time was spent working on the next new coach as it was felt that due to all the rain we have had recently it would have been folly to take heavy machinery on to the land. Excellent progress was made (once we had sorted some of my earlier mistakes). We managed to assemble the whole of the non door side of the coach and fix it to the chassis. In between working weekends John has been carrying out sterling work on Monty and nearly all the maintenance work has now been completed. Just the clutch to sort out and Monty will be fully restored to running condition again. The overall attendance was slightly disappointing but this is the first time we have held an open day over the Easter Weekend and I suppose it will take time for the word to spread. We had more visitors on the Sunday than the Saturday so maybe next year we should consider opening on the Sunday and Monday instead. It was really good to see several friends and family members and overall we had a very good fun weekend. 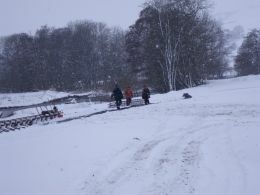 Thanks go to all the volunteers who helped run the railway over the weekend and to get it ready in advance. Your help is really very much appreciated. If anyone has any photos of the Open Weekend that they would like to share then please send them to me and we will get a gallery created and put on the web site. There are some great photos and videos on our Facebook Page. We had a couple of minor derailments with one of the four wheeled coaches. This was discovered to be due to a section of track having gone out of gauge. This was quickly repaired by the permanent way crew. While the repairs were being carried we operated with one engine at either end of the coaches so that at no time were the coaches being pushed by the locomotive. A first for the RVLR I think. The whistle valve on Powys has been leaking slightly for some time. On Saturday the valve was leaking more than usual and towards the end of Powys�s first run the boiler pressure dropped to a very low level and the engine had not got enough steam pressure to get up the bank in to the station. The decision was taken to withdraw Powys from service, drop the fire and try to repair the whistle valve in time for Sunday running. Once the whistle valve had been removed it became clear that the problem was a ball bearing not seating properly in the valve. After a good clean we managed to get it to seal, but not consistently, so we decided to run Powys on the Sunday without a whistle. This proved to be successful but we do need to get Powys�s whistle valve properly overhauled before we steam again. I think a quick visit to Mr. James is called for !!! Well we are nearly there. Had an excellent day on Monday. 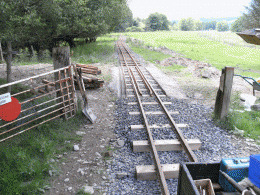 Ian, John and myself managed to make up the last track panel, move the remaining track panels in to place and join up the remaining new track panels so that the whole new length of track is fishplated up. We did have a few problems getting some of the fishplates to sit neatly in to the rail web but the skilled use of the angle grinder by John soon sorted the problem. So for the second time I went home with hands covered in permanent way grease. Boy does that stuff stick to skin !!! So just the stepped fishplates to make and then everything will be joined up. It will be touch and go for Saturday but being as we have Friday this week to work on it I think we should make it. Open days Saturday and Sunday. Should be fun if it doesn't snow !! Well what a great weekend we just had, great weather and loads of progress. A great turnout, Steve, Dawn, Karl, Ian, John and myself on Saturday. John, Ian, Bob and myself Sunday. We hired in the mini-digger and the Manitou again and really got stuck in. 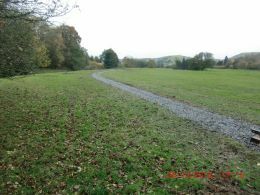 We managed to finish all the digging out, lay the rest of the geo textile and move and level about 45 tons of stone on Saturday which completed the new track bed over the complete 200 metres that we are replacing. On Sunday we laid all but 3 of the completed track panels in position and fishplated 7 of them. So we are close to having a complete loop again and I'm very grateful to all those who responded to our shout for help!!! I really am very grateful. So all we to do now is build one more track panel, lay the last 4 panels and connect everything up. To that end we will be working Monday 2nd April to try and get finished. We used the new P-Way Lubricant for the first time and I must say it seems to be very good if not somewhat messy. Well we had a really good day last Monday and actually managed to get everything done that we planned. Ian, David, John and myself managed to make up 7 track panels, survey and level the rest of the track bed and cut the geotextile roll ready for this coming weekend. Excellent. Thanks to you all. 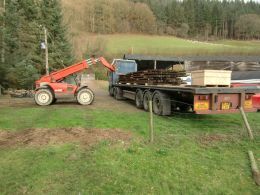 Les, Ian and myself had a very productive day on Monday and we managed to move and lay about 30 tons of ballast. Only another 45 tons to go !! We are fighting a bit of a rearguard action now in an effort to be ready for our Easter Open Days. We are going to hold some extra working days on 19th, 24th and 25th March and 2nd April. Hopefully we will get a good turnout and get everything finished. We have to make up another 6 track panels, lay the rest of the vapour barrier and ballast. Position the track panels and connect them all up. We also need to check the timing on Powys and get Monty serviced. Should be fun. Also a great day today as the new lathe and miller have been delivered. Well we had a great weekend in spite of the weather forecast. At one time it did look as if rain would stop play but fortunately the "railway gods" smiled on us and we managed to get a lot done. A good turnout made a big difference with Ian, David, Andy, Jezz, Jack and myself on Saturday with Bob joining us all on Sunday. Thanks go to all of you who turned up. Tricia, as usual, provided the snacks and Jack ate most of them !! Over the course of the weekend we managed to finish the digging out of the trackbed, we moved all the completed track panels off the station platform and put them alongside the track bed ready for laying, we put down the ballast and vapour barrier for 4 lengths of track and put three of them into position. Pretty impressive you must agree. All this was made possible with the hire of a mini-digger and telehandler from our local man. Thanks Karl. We have recently purchased the fish bolts we need to join up all the track we are laying and some permanent way grease to lubricate the fishplates with before they are bolted up. This should help to ease possible buckling of the rail due to heat expansion in the summer (if of course we have one this year). In spite of this great progress we are still behind with our program so it looks as if an extra working weekend will be needed. This will be on the 24th 25th March. I look foward to seeing as many of you as possible then. Thanks for now. Well due to the terrible weather forecast the turnout was understandably low. Well when I say low, Ian and I on Saturday and just me on Sunday. The weather forecasters got it wrong for SY21 and we had a relatively fine weekend. We made good progress with the new track panels and we now have 14 of the required 20 built. Looking forward to a big turnout in March. Well Saturday brought quite a cool start to the day, very frosty. This weekend we started to make up the 20 30ft track panels that we will need to replace the 200m of track that we removed before Xmas. We started by making up a jig for drilling the holes for the spikes. We decided to make the jig for pilot holes so that the hole size in the jig would be less likely to distort with use. This proved to work quite well. Ian made up the jig. My attempt was a disaster. We started by drilling up 14 sleepers for the first length. We laid these out on the station platform so that we had a firm level (well nearly level) base to work from. The sleepers were space out with 500mm between each and then we leveled the ends to give approximately 250mm at each end of the rail to the first sleeper. Once we had checked that the whole thing was square, by comparing diagonal measurements, the panel was spiked up. Over the weekend we managed to make up three complete panels. 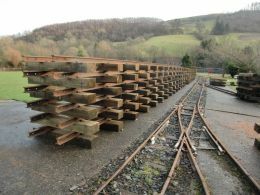 Stack all the new sleepers on the platfrom ready for use. Pre-drill about half of the 300 sleepers and sort all the rail we need for the 20 lengths we are going to make. We had to rely on Carl again with his Manitou to lift the rail and help sort it as our Fergie is not really suited to this heavy work. One thing we learnt for sure is that we will have to organise some extra working days if we are going to run at Easter with a complete railway. Thanks to David and Ian for their help and Tricia again for the excellent catering. We had a very productive weekend in spite of the Welsh weather's best efforts on Sunday morning. The remaining 70m of track scheduled for replacement this winter was lifted. We then removed all the old sleepers from the rail together with the 130m we lifted in November and then the whole lot was loaded on to the dumper and then moved and stacked ready for sale. 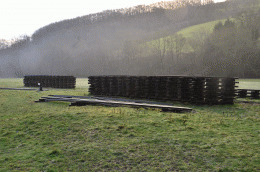 The old sleepers were then tipped ready for burning and spike salvage. Thanks to Keith, James (ace dumper driver), Ian and David for all their help. We nearly got the job done on Saturday but were thwarted by the "curse of the flat battery" and so had to finish off Sunday morning once the dumper decided it wanted to play. We had just got the rail stacked when a prospective rail purchaser arrived, great timing. Bob and I then spent Sunday afternoon looking at the timing on Powys which had been reported as "out" during our last running weekend. So a very productive weekend and thanks go to everyone who helped and a special thanks goes to Tricia for keeping the flow of tea, coffee and bacon sarnies going. 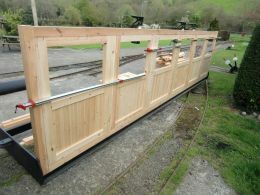 The rail we purchased from the RHDR was delivered on Saturday together with fishplates and some wheel sets. Karl came down with his Manitou and unloaded the rail. It wasn't the easiest job we have done this year as the rail which in the main was in 30ft lengths was blowing about a bit in a rather stiff breeze. We had to take a fence down to get the machine through in to the paddock where the rail was stacked. Still, we managed it, and without a misshap. Jezz and I then spent a very rewarding hour and a half with a Snap On impact wrench and removed all the rest of the fishplates from the rail that is being lifted and replaced this winter. Thanks to Karl for the loan of a great tool. I want one!! We had a very productive first weekend. Karl brought his mini-digger down mid-morning and by the time Andy and Jezz arrived we were all ready to go. Over the course of the weekend we managed to remove the bolts from 130m of track, this was very hard work and we need to find a better way of doing this. Fish Plate removal proved to be a major bottle neck. We tried cracking off the nuts with a cold chisel, we tried over tensioning with a socket on a long bar, we tried removing the nuts with sockets and spanners. While all methods achieved some success the process was slow and very hard work. 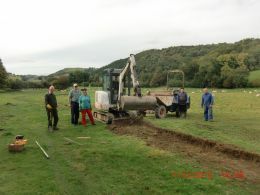 The old track bed was dug out using the mini-digger. This proved tricky at first but once we had sorted out the right bucket it proved to be very successful. We pegged out the gradient profile from data gathered with a level and staff. The gradient is 1 in 200. My thanks to everyone who helped with a very succesful weekend. Andy, Jezz, Simon, Jack and crew.